It is the 4th day of Tiny Prints week at Sweet Peas & Stilettos and today’s steal is…..(insert drum roll)…..a huge 35% OFF personalized mugs. I can remember way back (what seems like a million years ago) when you could first put a photo on a mug, and a plain canvas bag and a t-shirt. I thought it was so cool. Since then it has never crossed my mind to do it again. Maybe it is because I dream of the day that every mug on the shelf might actually match one day. But now that I have parents and in-laws who don’t want and need a whole lot (or anything for that matter) for Christmas, I have to tell you the photo mug with a cute picture of their grandson might just be the perfect little gift. My mom doesn’t drink coffee but I am sure she would love it on her desk to put pencils in. I was thinking of dressing up my son in his SF Giants gear and making a mug for my father-in-law. What grandpa isn’t going to love seeing his little slugger every morning while he sips his coffee and reads the Wall Street Journal? And if you want to skip the photo, they have some really cute, modern patterns so you can make fabulous personalized mugs. Maybe I can finally giveaway all of the random mugs on the shelf and make myself a complete matching set! To save 35% OFF today, just use promo code: cyber1129. The sale ends tonight 11/2912 and 11:59PST. Still haven’t ordered your holiday cards yet?? Guess what – you are in luck! The folks over at Tiny Prints have decided to extend their Cyber Monday Sale even longer! You now have today and tomorrow to save big at their 30% OFF Sitewide Sale. Jot down the promo code: CB12 so you can enter it into the little box when you checkout. In case you don’t spend as much time as I do on the Tiny Prints website, just remember that there is so much more to Tiny Prints than birth announcements and children’s birthday party invitations. They have so many cool personalized gift ideas that are all very well priced (and even cheaper today and tomorrow!). They make is super easy to personalize everything by writing your own text, uploading cute pictures, and making everything unique and extra special. Don’t forget, this super Tiny Prints sale ends Thursday night (11/29/12) at midnight PST. Go go go and start creating (and saving) now…. Tiny Prints week at Sweet Peas & Stilettos continues with another great daily steal of a deal. All day today you can save 35% OFF Stamps & Embossers. I know you probably get a bunch of those free stickers in the mail with your address printed on them. I am not sure why so many people send those?? Anyhow, those are fine to use on bills, but these custom ink stamps are great on letters and invitations. You can pick one up to use on your holiday cards and then continue to use it all year long. And you don’t just have to make address stamps…how about one with your initial that you can use in books or on notepaper? And there is something very historic and beautiful about embossing. I haven’t used an embosser in a million years, it might be kind of fun to actually have one for my family. Go take a look and see what you think for yourself. They are both certainly great personalized holiday gifts. Keep on saving and I’ll have another great Tiny Prints deal for you tomorrow! Oh one more thing – the promo code to save on the stamps and embossers is: CYBER1128 and the deal expires tonight. Wednesday, 11/28/12, at 11:59 pm PST. Just in time for Christmas — welcome to the Toy Box Sale at One Kings Lane going on now through Thursday, 11/29/12. You will find a great selection of toys at every price range. From a classic wooden yo-yo to stuffed animals, puzzles and Melissa & Doug favorites you’ll find fun toys for boys and girls alike. For your littlest car lover there is everything from these great wooden car push toys (only $8!) to this very cool Mercedes. You know your kids will love taking it for a spin around the driveway. If you want to go all out – you have to check out the ride on Lamborghini Murcielago too! Hope you find something your kids will love. Looking for the perfect stocking stuffer? Today is the day to save on these fantastic personalized photo iPhone cases from Tiny Prints. You may have seen that Tiny Prints already has an amazing 30% off sitewide sale going on right bow but you can save even more on their new photo iPhone cases. All you need to do is enter promo code: CYBER1126 to save on these great phone covers. And guess what – they even have covers for the iPhone 5! This great deal expires tonight, 11/26/12, at 11:59 pm PST, so click on over there pronto. And one more thought – personalized cell phone cases & covers are great gifts for friends and family who live far away because they will be so easy & inexpensive to ship anywhere. Have you heard about Treat? The folks over at Tiny Prints and Shutterfly have created this cool division of their company where you can create personalized, one-of-a-kind cards for every occasion – from birthdays and congratulation notes to sympathy cards and everything in between. For ONE DAY ONLY (today), you can save up to 60% on Treat greeting cards with the Treat Card Club. You can use the promo code CYBERTREAT all day long on Cyber Monday and save 30% on their already discounted card packs. By pre-ordering your cards in bulk, you save a bundle now and then you just send the cards out whenever you want to. If you have a little extra time on your hands, you can literally create individualized holiday greeting cards for every friend and family member. Such a cool idea! Or you can order (or pre-order) personalized birthday cards and thank you notes you will be ready to send cards all year long. The more cards you send, the more you save. I just bought a birthday card for my mother-in-law at the drug store a few weeks ago and it was almost $5.00! And it wasn’t even that cute… Shopping at Treat is the certainly the way to save. Treat’s card plans take the hassle out of buying and sending cards, and they make it super easy, crazy fun, and totally personal to create a card for someone special. Treat takes care of the rest. To take advantage of this amazing CYBER MONDAY deal (it ends at 11:59 PST on 11/26/12) remember to use the Treat promo code: CYBERTREAT. It is the start of Tiny Prints week at Sweet Peas & Stilettos and I can promise you it is going to be an amazing one. There are awesome daily deals every day this week and you will also be able to save on your Christmas cards & holiday party invitations. I am so excited to get tons of my holiday shopping done at Tiny Prints and I hope you are able to stock up and save a bundle too. Today is CYBER MONDAY and to celebrate Tiny Prints is offering 30% OFF SITEWIDE. You heard it here – the sale is not just on a few random things you would never want (don’t you hate that?!?!) but they are telling me it is sitewide so that means everything and there is no minimum purchase required. The Tiny Prints Cyber Monday promo code is: CB12. And guess what – you have both Monday & Tuesday to shop for personalized gifts, photo gifts, stationery, Christmas cards and so much more. Got to love the extra day of savings! UPDATE: Even thought I was told this was a sitewide sale on everything I do think there are a few items excluded like Erin Condren planners and other things. At a minimum you should be able to save on all of your holiday orders. Party season is here! Now it is time to find the perfect party dress. I have a new favorite shopping spot, ModCloth, and they have so many beautiful dresses to choose from. Personally I like to find dresses that I can wear to all sorts of events. Swap out the shoes, add a jean jacket or leather jacket, try different colored tights, wrap a cool scarf around your neck – there are so many to switch things up. I love both of these Tracey Reese dresses – they are both so so so pretty! Pictured above is Tracey Reese’s Orchestral Arrangement Dress and below is Tracey Reese’s beautiful Night of Passage dress. 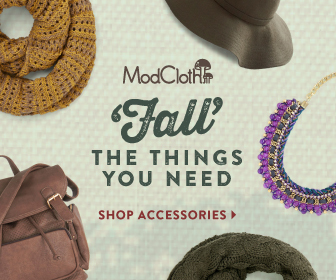 The ModCloth ‘Tis The Season Sale started today and runs through 11/25/12. The ModCloth ‘Tis The Season Sale is an amazing opportunity to save on 100s of brand new styles. Many of them are up to 50% off! They also offer FREE US shipping on sales over $50 + free returns too. You can stock up on holiday styles and Christmas gifts galore. I am always on the lookout for pouches that I can use to carry around all sorts of little things. Every once in a while I find one that should be used as a clutch and not be hidden in my big ‘ol bag. This Deux Lux Callie Pouch is just one of those practical little pouches. I just love it. It is available in three cool color combinations – each one more vibrant than the next. These perfect pops of color will brighten up your winter blacks and greys any day. This Lucky Wristlet is also a fabulous choice. It is ideal for those holiday parties when you are carrying a champagne glass in one hand, an hors d’oeuvres plate in the other, while at the same time you are trying to show the hostess an adorable picture of your kids on your iPhone and holding onto your party clutch…. Acckck! I know you’ve been there…. This pretty wristlet is available in six colors and can keep your hands free all night long. And they are all on sale right now and priced perfectly for those last minute holiday gifts. Cheers!